Spike TV Winners and Losers of 2008. The western world had been waiting literally decades to get our own Skyline, and we finally did, the R35 Nissan GT-R. And it was worth the wait. With twin turbo V6 making a notoriously underrated 480hp and some of the most advanced technologies available in the automotive market today, the GT-R showed up the Porsche 911 GT-2, the reigning king of Germany’s Nürburgring, by breaking the Porsche’s lap record - for half the price. And with the brand new 2009 370Z already receiving accolades from motoring press around the world, Nissan’s performance division is really hitting their stride right now. Not only do they have Nissan in the winners list, they have Porsche on the Losers list because of their try at running a GT-R at Nurburgring. 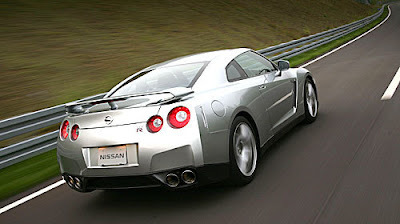 We are aware that several automakers have purchased the GT-R for their own testing and evaluation. We would welcome the opportunity to help any auto manufacturer with understanding the full capabilities of the GT-R.
Then Nissan went back to the 'Ring and ran the same lap a second time. Sorry Porsche, it's true. The GT-R is faster. Deal with it. You just look like jackasses now. You would think by now people would know that the R35 is not a Skyline...I guess, it takes time. The G35 is more of a Skyline then the R35 (well sort of).